Two people were seriously injured and seven more treated at the scene when a light aircraft crashed in Kent. Firefighters attended Headcorn Aerodrome at 1604 GMT on Sunday after reports that the aircraft had hit a static display plane. The plane was carrying eight parachutists when it reportedly crashed during an aborted take-off. Kent Ambulance Service said the pilot suffered severe head injuries and one male skydiver had chest injuries. One female passenger was later transferred to hospital after suffering a severe asthma attack, rescuers said. The pilot, a man in his 20s, was cut free from the cockpit by rescue teams before being flown by air ambulance to the Royal London Hospital for emergency treatment. Two parachutists were taken by ambulance to Maidstone General Hospital. 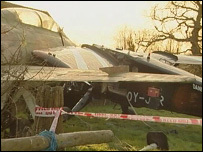 Headcorn Parachute Club manager Jane Buckle said: "The pilot decided to abort take-off and he didn't stop in time and he crashed. "We're all pretty upset about this happening. It's people we know. It's our aeroplane." She confirmed that the De Havilland Turbo Beaver was carrying eight members of the club when it crashed at the end of the runway. 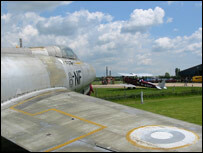 It hit a static display aircraft which forms part of an aircraft museum at the site. She added that the pilot was a full-time pilot employed by the club. A spokesman for Kent Police said: "Police are preserving the scene to allow the Air Accident Investigation Branch to conduct their inquiries." Headcorn Aerodrome is situated about 20 minutes by road from Ashford and has two runways. It was founded in 1927 by Mark Freeman and used for private flying until 1942, when it was requisitioned as an advanced landing ground by the American and Canadian Air forces. When the war ended in 1945 the Aerodrome was handed back to the Freeman family. As well as being home to the parachute club it also offers helicopter and balloon flights, flying lessons and pleasure flights. The Aerodrome also features the Lashenden Air Warfare Museum, providing visitors with an insight into the war years at the airfield with a number of historic exhibits.